Rust, sometimes referred to as patina, can be desirable to collectors. Rusty bike repair often focuses on the moving parts. The rust on the frame is mostly cosmetic, and how much you remove is up to you. 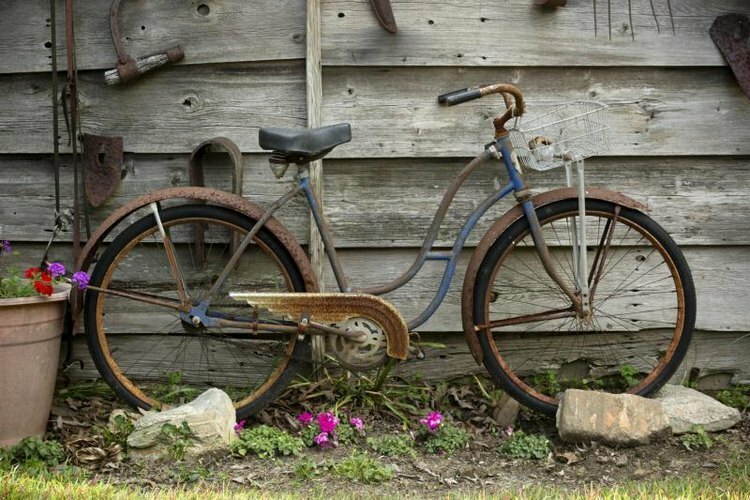 Safety issues come to the fore when working with rusty bikes: Never use oil or polish on rims, as it causes brake failure. Cracks or splits in the frame can cause catastrophic failure. If you find any, discard the bike. Apply penetrating oil to a small area of rust. Scrub the area with steel wool using a circular motion until shiny. If the steel wool isn't working the way you desire, switch to crumpled aluminum foil. Do the frame, fenders if applicable, and seat post. If the seat post was difficult to remove from the bike, buff it smooth with emery cloth where it enters the frame. Follow up by polishing everything with a soft cloth. Remove the wheels from the bike. If the axle nuts are rusty and fail to turn without excessive force, spray them with penetrating oil -- don't get it on the rims -- allow the oil to penetrate for a few minutes and then remove them. Contemporary axle nuts require either 13, 14 or 15 mm wrenches. Older bikes typically require 1/2- or 9/16-inch standard wrenches. The majority of rims are aluminum, which will not rust. You can skip this step in this instance. Scrub the sections between spokes on chrome or painted wheels with aluminum foil and water, or steel wool and water. Scrub up and down individual spokes to remove rust if needed. Scrub the gears on the back wheel. Drag a soft cloth between gears to remove particles. Scrub the crank arms and front gear or gears with steel wool and penetrating oil. Wipe them clean with a soft cloth. Apply penetrating oil liberally to the chain. If the bike has hand brakes, it's fine to pedal it backwards while spraying the oil on the chain. If it has coaster brakes, pedal it forward a few inches, spray the chain and repeat until the chain is saturated. Allow the oil to penetrate into the chain overnight. Spray oil on the brake calipers and derailleurs if applicable. Allow the oil to penetrate overnight. Break loose rusty chain links by manipulating them individually with your fingers. Apply more oil if needed. Pedal the bike with one hand, allowing the chain to pass through a soft cloth to clean it. Repeat until all the links move freely. Push and pull on brake calipers and derailleur pivots with your fingers to break them loose if needed. Apply a bike-specific, dry lubricant to individual chain links. Apply dry lube to derailleurs, cables and brake calipers. If your bike is rusty, it's likely that brake pads, tires, cables and cable housing could be suffering from wear and tear. Replacing these is recommended. If desired, finish shining the bike with car polish. Commercial rust removers that contain oxalic acid can damage your bike, so don't use them. When re-lubing the chain, use bike-specific lubricants only. Don't get lube or polish on wheels. Slippery wheels lead to brake failure.